Alfie Barbeary took time off from his busy schedule to call in at his home club. The England under-18 international attended the Wadworth 6X South West One East fixture between Banbury Bulls and Newbury Blues at the DCS Stadium. Barbeary captained England against South Africa in the summer and presented club president Neil Chapman with his shirt from the international game. 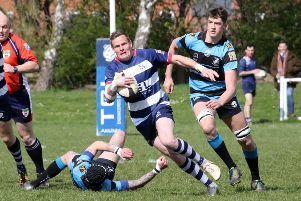 The former Banbury Academy Colt has made the step up from the Wasps Academy to the senior men’s A side this season. And he quickly adapted to senior rugby by scoring a try against Worcester Cavaliers earlier this month. Talking about his time with England in South Africa this summer, Barbeary, from Deddington, said: “It was a great experience going out there, really good fun. On breaking into the men’s senior team at Wasps, Barbeary added: “It’s a really big step up from the academy. It’s like nothing I’ve ever experienced, it’s a lot quicker and more physical.